The Ford Fusion leads the pack among mid-size sedans, bringing the hybrid technology of the future into the present. We here at Fremont Ford suggest the Fusion to individuals and families who value high efficiency at a reduced cost to the environment. Here's how the Fusion's tech features achieve this goal. Do you prefer gas or electric? Maybe you prefer both? 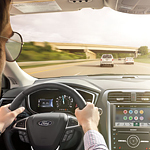 Ford Fusion gives you the choice with three energy modes to chose from. EV Later saves plug-in power for future use, whereas EV Now lets you use plug-in power in the present. Auto EV switches between electrical and gas power as needed. Each mode delivers great city/highway mileage while reducing emissions that are harmful to the environment. The LCD SmartGuage cluster helps you drive more efficiently by displaying engine power and battery power. It also tells you how close you are to the engine/gas on/off boundary, with special configurable screens and coaching to help you optimize vehicle efficiency. The right-side cluster even displays flourishing vines and leaves as your driving becomes more efficient. See the SmartGuage with EcoGuide for yourself. Swing by Fremont Ford today for a test drive.